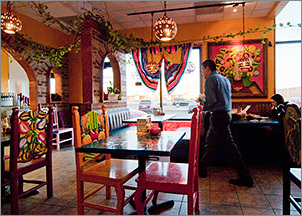 El Maya prides themselves on serving delicious Mexican food that's full of flavor with a memorable dining experience. Their award-winning dishes are made using fresh ingredients, served by a friendly staff. Their fun-filled atmosphere is the perfect meeting place for any fiesta - birthday parties, bridal showers, and more! This restaurant looks like not much from the outside. Sandwiched between a coffee house and a gas station convenience store the outside reminds you of one of those gas station/taco bell/laundromat combos. Inside however it has a decor of mexican tiling, carved colorful wooden chairs and mexican murals. The waiters are entertaining as they balance bottles of beer on their head or carry out armloads of sizzling fajitas. The chips and food are great. My wife and I once ate there, each had a dinner and a drink and after we finished a shotglass appeared in front of both of us. We asked what it was. It was called an El Torrito and it was compliments of the house. I asked what was in it and he said, Kahlua, triple sec and ground peanuts. Ground peanuts sounded odd, but when I tasted it it tasted just like a chocolate covered cherry. The oil from the peanuts brought all the flavor to the surface and the ground peanut parts help give it texture and hold the flavor in your mouth. The flan is also good. I went to dine at El Maya Mexican Restaurant which is located in West De Pere near the Scheuring Road exit by Hwy 41. As soon as I entered I felt like I had left Wisconsin and landed in Mexico for my dinner. The wonderful aromas, bright festive decor and Mexican music playing in the background lifted my spirits on a dreary March evening. The walls were painted in a deep bright yellow with a variety of huge brightly colored pictures of different flowers on the walls. All the wooden chairs were painted in bright colors, and partially covering all the windows were serapes. The decor was tastefully done and everything looked spotless. I could not help but notice how creatively they displayed a fresh ivy plant with the continuance of growing vines wrapped and strung up on thin wires that hung from the ceiling from one end of the room to the other. Towards the back of the restaurant was an open kitchen where you can see the cooks working quickly in clouds of steam and sending smells of different spices drifting through the air. There is not a bar but they do have a decent drink list that you can order from. The servers were in neat uniforms of black pants and white shirts with attractive vests. The service throughout my meal was not only very attentive but they were all very polite and courteous. I ordered one of their specialties, the Parrillada Azteco for $29.99, which states on the menu it is enough for two people. The dish is a mixed grill with lobster, shrimp, chicken, beef, and Mexican sausage with two cheese quesadas made with corn tortillas. While I was waiting for my dinner I observed that the servers never used trays to carry the dishes and beverages but since the plates are very hot they used an oven mitt that ran up past their elbows and would stack all the dishes down the length of their arms. As I was waiting I also indulged in snacking from the basket of tortilla chips into the bowl of fresh homemade salsa and a small dish of bean dip. The chips were fresh with a nice crunch and the sauces were delicious. My food came quickly, it came steaming hot on a huge oval platter with a mouth watering presentation. The platter was piled high with a split lobster tail on top of each side and a whole fresh lemon quartered and place on top. There was a large side platter of fresh guacamole, sour cream, rice, bean spread, and chopped lettuce with tomatoes. You have a choice of flour tortillas or corn and I chose the flour which came warm and wrapped in tin foil. My meal was stupendous, the beef and chicken were tender and the shrimp were large with a very good seasoned flavor. The tomatoes, peppers, and onions were bountiful. The Mexican sausage was ground with a mild sweet spicy taste, and the freshly made guacamole with its delicate flavor combined came together very nicely. El Maya is an authentic Mexican restaurant with delicious food.